Just as we know that fruits and vegetables contains vitamins that helps and prevents the body from diseases, so as pineapples does. 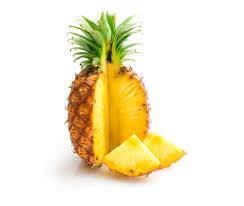 Pineapple is a fruit with lot of benefits to the body and when you eat pineapple daily, you get a whole lot of benefits which are described as you read on. 1. Reduce Aging Process: Pineapple contains vitamins that keeps the skin smooth, prevents wrinkles of the skin in elderly people and it prevent activities of age related problems such as skin. 2. Blood Pressure: one of the benefit of eating pineapple is the fact that it keeps the body safe of increasing blood pressure because pineapple contains elements like potassium which lowers blood pressure. 4. Weight Loss: Pineapple contains fibers which helps fasten the digestion process, increase body metabolism and burn some calories in the body which helps to maintain weight and shed excess weight in the body. 5. Digestion: An important benefit you get when you eat pineapple is that aids digestion because it contains over 60% of fibers in it. It also contains water which also help to fasten digestion process and prevents constipation. 6. Fertility: Pineapple has lot of benefits especially in Adults who surfers fertility problems. One of the natural ways to solve that is to eat pineapples because pineapple contains elements and removes free radicals which makes it difficult for people with low fertility and trying to have their own child. Vitamin C, Beta-Carotene and zinc which helps boost fertility. 7. Prevents Diseases: When you eat pineapple, you stand a chance of not contacting diseases because Pineapple contains Beta-carotene and other vitamins which helps to fight diseases, repairs worn-out tissues and best recommended to fight cold and catarrh. 8. Heart: Pineapple is recommended for better functioning of the heart because it contains fiber, no fat, no oils, no sugar but potassium and vitamin-c which helps regulate the pressure of the heart. These are the health benefits of Pineapple to the body. You need to start eating this fruits either raw or in a processed form like the pineapple juice. When you eat this fruits daily, you are investing to your health to live long. Thanks for reading.